Gus Wigen-Toccalino with West Monroe Partners talks with guests about blockchain technology. 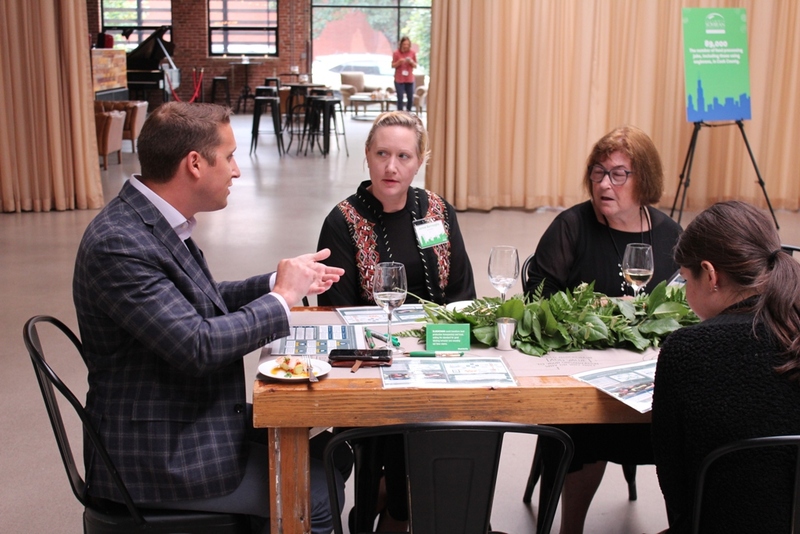 On Aug. 7, food industry stakeholders met in Chicago to talk about blockchain, CRISPR and drone technologies and their implications in the food supply chain. SPRINGFIELD — Gov. Bruce Rauner and first lady Diana Rauner bid $60,000 to purchase the grand champion steer exhibited at the Illinois State Fair Governor’s Sale of Champions last week. The sale, which is the marquee event of Agriculture Day at the fair, showcases the hard work and dedication of youth in the agriculture industry. A pair of new records were set during the sale, though the purchase of the grand champion steer from Adam Miller of Livingston County. A new record of $11,300 was bid for the grand champion meat goat, Wether, owned by Chase Tomhave of Morgan County. A mix of businesses and individuals invested in the purchase. In addition, a record $2,600 was bid by the Rauners for the grand champion honey entry from Nancy Sweet of Chatham. The grand champion and reserve grand champion exhibitors receive a portion of the proceeds from the sale of their entries, with many using the money toward college education or investing it back into projects for the following year. The grand champion Land of Lincoln steer was owned by Tara Hummel of Kankakee, and was purchased by BRANDT for $3,000. Each of the grand champion exhibitors took home around $6,000 in scholarships, thanks to donations from the CME Group, Compeer Financial and the Illinois 4-H Foundation. Goats, sheep, barrows and steers involved in the auction were donated to the University of Illinois College of Agricultural, Consumer and Environmental Sciences. URBANA — The fallout from the larger-than-expected harvest forecast for 2018 corn and soybean crops issued by the United States Department of Agriculture predictably sent harvest futures for corn and soybeans tumbling lower. This was the observation of University of Illinois agricultural economist Todd Hubbs, who said the USDA’s most recent projected yield forecast of 178.4 bushels per acre for corn and 51.6 bu./acre for soybeans came in above trade expectations. Illinois’ soybean harvest is projected at 64 bu./acre, up six bushels from the final 2017 Illinois yield. The U.S. average soybean yield forecast of 51.6 bushels for 2018 was two bushels larger than trade expectations. Increased soybean stocks led to an increase in the export forecast for the 2018-19 marketing year of 20 million bushels, however, reflecting recent strength in soybean exports. However, the forecast for the marketing-year average market price decreased by 35 cents to a range of $7.65 to $10.15 per bushel. Where that price ends up is largely dependent on developments in trade issues over the next year, according to Hubbs. Discussion and graphs associated with Hubbs’ article can be found at www.youtu.be/x/YirAckZyo8. CHICAGO — Illinois Soybean Association farmer-leaders met with business and technology consultants in Chicago Aug. 16 to discuss how technology can help the state’s soybean industry grow more efficient and sustainable. On the table: food production benefits from technology applications like autonomous driving and GPS field mapping. The meeting also included discussion of up and coming technologies with a potential major impact on agriculture, including blockchain, CRISPR and drones.